Premier and Minister of National Security, Michael Dunkley today [Sept 9] expanded on the mandatory carding legislation which is to take effect on October 1st, which means that if requested, people will need to present your photo ID when buying alcohol at any licensed premises, such as a bar, restaurant, grocery store, night club or anywhere where alcohol is served. The Premier was joined at today’s press conference by club and restaurant owners and managers. Left to Right: DNDC Director Joanne Dean, Flanagan’s Chris Garland, Premier Dunkley, Jean-Claude Garzia, Chef and owner of Beau Rivage and the Chairman of the Hotel and Restaurant Division of the Bermuda Chamber of Commerce, Anthony Santucci, Executive Director of CADA and Mr. Sherwin Richardson, Acting President of the Warwick Workmens’ Club. “What does this mean? It means that if requested, you’ll need to present your photo ID when buying alcohol at any licensed premises, such as a bar, restaurant, grocery store, night club or anywhere where alcohol is served. “The aim of the recent amendments is to add to the safeguards required to prevent underage drinking. Research has shown that alcohol abuse by young people and its associated problems have profound negative consequences for minors, their families, their communities, and the society as a whole. I am joined here today by Mrs. Joanne Dean [Director of the Department of National Drug Control], Mr. Anthony Santucci [Executive Director of CADA], Mr. Jean-Claude Garzia [Chef and owner of Beau Rivage and the Chairman of the Hotel and Restaurant Division of the Bermuda Chamber of Commerce] and Mr. Sherwin Richardson [Acting President of the Warwick Workmens' Club] to announce the “We Card” Initiative. “On Wednesday October 1st, the new regime for mandatory identification carding will come into force. A series of media releases, radio interviews, public service announcements and social media presentations are scheduled to highlight the enactment of the mandatory carding regime and the “We Card” Initiative. What does this mean? It means that if requested, you’ll need to present your photo ID when buying alcohol at any licensed premises, such as a bar, restaurant, grocery store, night club or anywhere where alcohol is served. As the public is aware, the Ministry of National Security introduced the Liquor Licence Amendment Act 2014 which was passed on 21st July. It requires those establishments holding licenses other than nightclub licenses that offer music etc until 3am to ensure that they demand ID after 11pm from persons who appear to be minors. Additionally, the Amendment Act created offences for the breach of these new requirements. It also compliments efforts by organizations like CADA, the DNDC and PRIDE by providing the enforcement safety net required as part of reversing any trend towards alcohol abuse in our community. The aim of the recent amendments is to add to the safeguards required to prevent underage drinking. Research has shown that alcohol abuse by young people and its associated problems have profound negative consequences for minors, their families, their communities, and the society as a whole. The Ministry of National Security continues to collaborate with important partners on all aspects of this issue. The public will also recall that in the summer of 2013, I convened a meeting of the owners and operators of liquor licensed premises in Bermuda. The matter of mandatory ID checks was an item discussed and identified as a priority. In last year’s Throne Speech we promised to address this issue and the implementation of this legislation represents an important promise kept by this Government. 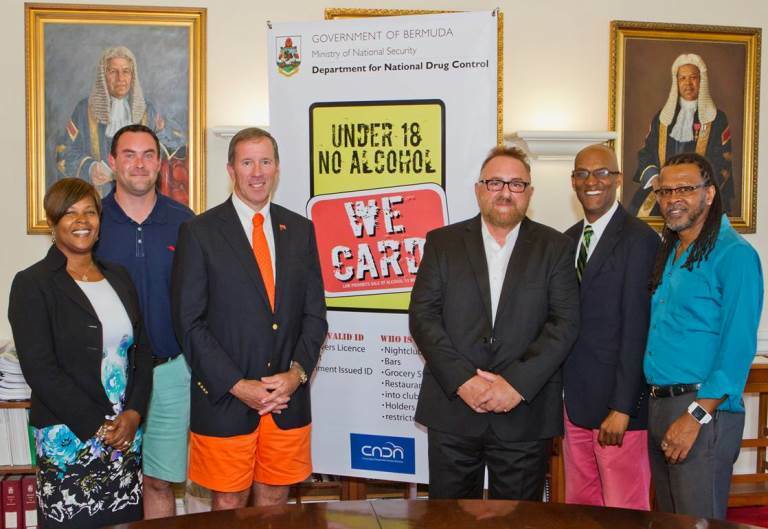 Finally, I wish to thank CADA and the owners and operators of licensed premises in Bermuda for their desire to work with the Government on the We Card initiative and the implementation of the law on Wednesday October 1st, 2014. As partners, we share a vision of a community that encourages responsible alcohol consumption and behaviour. Maybe I’m a bit late but doesn’t this happen already?! If you look under 18 then you must produce an ID if asked. I’m sure people card already, but you know Dunkley loves the Camera. he really can’t help himself. Great job Premier, recycling a prison jump suit into a tie and short shorts, nice touch fiscal prudence! Typo: I couldn’t help it etc. I hope I don’t need a card when I drive through these Private Estate roads !!!!!!!!!!!!!!!!!!!!!!!!!!!!!!! The cattle man is just biding time–hoping to be quickened with the milk of knowledge and understanding of real leadership and just how to pasteurize it. For him, it hasn’t happened and isn’t going to and so, for the time being, we are suffering through his vacillating. Must say he tries, but clearly he is a man operating the political vehicle with a defective GPS system, and many of us–his passengers are agonizing over where his ride is taking us. He overcompensates for his lack by maintaining the appearance of constructive busyness which hasn’t amounted to a damn thing–zero, zilch, nought. It is time for change for REAL LEADERSHIP on this island. I know what stands in the way, and if I were the almighty it would be removed pronto. I thought they already do this…. Yes their own ads inform us the brain develops until 25 so you can get a full 7 years of brain damaging “fun” before you mature. Nice. It requires those establishments holding licenses other than nightclub licenses that offer music etc until 3a.m to ensure that they demand ID after 11 p.m from persons who appear to be minors. Additionally, the Amendment Act created offences for the breach of these new requirements. Smoke and mirrors my friend. The legislation merely permits licensees to examine the ID of any person “who appears to be a minor”. This already happens and it is already an offence to provide alcohol to anybody under the age of 18. This really changes nothing while lending the appearance of doing something. Still is not mandatory carding as the test is a very subjective one. Realtalk you hit the nail on the head. He’s giving the appearance that he is doing something when there’s a system already in place that just needs to be implemented More BS from your local politricster. Raymond Ray you are ultra understanding when it comes to EVERYTHING your OBA Government does, and quite the opposite with the Government in waiting–you know who that is. Will ALL licensed premises exercise the same vigilance, diligence and work closely with the men and women in blue when it comes to the minors of guest visitors? How will social gatherings/functions held in/at unlicensed venues: residential weddings, birthday celebrations, funeral wakes, etc. be monitored–under an islandwide, Uncle Michael-is-always-watching-hawkeyesystem? My gut tells me that there is something more to this carding system than can be pinpointed at this time (perhaps we will all understand why in the sweet by and by). The simple solution to these destructive vices is down the booze and out the cigarettes (fool at one end and fire at the other). To make it simply. If an individual is caught drunk or gets into a fight and is not only under the influence but also under age then that’s where the police step in with finding out (if possible) how the individual got hold of the alcohol. Hell…I still get carded here in the US and um 65 yirz hole. I just bring my booze in a Listerine bottle and order a coke. It has to be used within reason. I had a very heated ‘debate’ with an over zealous bartender at a local east end bar. He didn’t want to serve me a drink because I didn’t have my I.D. on me (I left my wallet at home and had stuffed a fifty dollar bill in my jeans pocket). I asked him, “Come on, you can’t tell I’m over eighteen?” His response was, “I don’t know that.” Mind you, I’m forty-five years old and a grandmother so I should have taken this as a compliment, but come on! Common sense should prevail. Makes sense, why not include mandatory carding for purchasing cigarettes as well. dont worry DK…its gunna be lottsa mandatory comin…HA HA HAAAAA! This is a step forward but operators should be mandated to card everyone and not just whomever they feel. In America a lot of places will not serve you if you do not present a gov issued id and you could look 15 or 51, everyone gets carded. The road Bermuda has taken will cause problems when one person buys and gets away with it and the next buys and gets carded. I asked him, “Are you kidding me, you can’t tell I’m over eighteen?” His response was, “I don’t know that.” Mind you, I’m forty-five years old and a grandmother so I should have taken this as a compliment, but come on! Common sense should prevail. On that note, I hope you didn’t empty your jeans pocket. Hell, they carded my Father when he was 90 years old. You are a liar. Smdh. A man with one foot in the grave would never get carded! He’s not lying. When we took my brother out for his first ‘legal’ drink in Boston he was fine. My father on the other hand didn’t have his drivers license or passport with him and couldn’t be served according to the restaurant manager. And to make matters worse it was his 70th birthday! To make matters worse we found out there were half a dozen German tourists who met the same fate and complained to the concierge back at the hotel. Needless to say the restaurant has lost a lot of potential business. You’d be surprised at how many places in the US card everybody, no exceptions, regardless of how old they look. You’d also be surprised how many places in the US won’t accept out of state drivers licenses either. The amendment does 4 things Rhonda. Try reading them. WHAT!? Tell me you didn’t spend all this time to reiterate something that’s already in place. Am I missing something here? This wont make any difference at all…getting Booze n Drugs in Bermuda is easy. Still too easy. Try buying alcohol in Montana. First of all, you can’t get it in markets. Second, you must present ID. No ID no buy. A camera is on the cashier & the cashier must be seen to be getting ID from the customer, no matter how old the customer appears to be. Same in Delaware. Don’t want to hear any complaints here. I mean really, someone just thought of this??? In College over 20 years ago you could not get into a club or bar without showing an ID. This should have been policy all this time. I am not surprised because no one is serious about stopping drinking on this Island. Bermudians love to drink!!! I don’t give a ratzazz what transpires in your “Other” parts of the world…if i attempt to purchase alcohol and i am asked by employee for ID…i shall in turn ask for theirs…because if you look at ME and think that i may be underage ,then YOU are legally blind or too inept to even be out of your house unsupervised…then you can keep whatever it is you sell, coz i will never buy it. ps…when carded make sure you cover your name and address…SHOW PICTURE AND THE PLACE OF ISSUE AND DATE OF BIRTH ONLY…because when you think about it ,those are the ONLY 3 things in question here…yes?? Why has it taken this long?? Having lived in Georgia, where “carding” is mandatory (in addition to a Host Liquor Liability Act), I have always wondered why we are reluctant to have our own such laws. I went to a wedding in Baltimore, and I went to a bar with an uncle of my wife’s, I bought the 1st round and was carded I was 50 at the time, the uncle who was 60 + was carded when buying the 2nd round. .. go figure. .. When I was a teenager I got carded just to enter a club. And it was always the law to not serve alcohol to anyone under 18. When did that law change? Why is this suddenly news after 20+ years at least??? I can’t stand this. They always ask for mine knowing damn well I’m older than 18 but the male bouncers at the doors just want to see your I.D. to be nosy. Guess all the kiddies gonna have to buy ids to get in the beach nights now. Kind of like someone with a permit to be a reverend, who ends up organising marches and running a quasi-political party? Card or no card, I need someone to reference one study that shows, this reduced drinking by Minors. Alcohol and drugs are readily available to all who wants to use them, no matter where in the world you are, even in Iran, where the sentence is death. This is just politicians being politicians. The only thing that has ever proven to work is education. The max fine is $500-.”commits an offence and is liable on summary conviction to a fine not exceeding $500.”;the fine is for the astablishment. I cannot see any fine for the person consumiming underage? So i read it as this all falls on the astablishment and nothing happens to the underage individuals even if they use fake ID! No one under 18 can work in any capacidy if the establishmet? So students working in supermarkets/and others are included? I wonder if they are going to spot check bars. Some establishments may be about the money so they won’t be strict about requesting. Personally, less kids in the bars is ok with me. This is an effort to appear to be doing something. Is this really the results of a forward thinking leader and his highly paid partners in crime? There must be a little more bang for the buck than this, I, for one, definitely think we deserve more. The fact that they claim to be only now getting around to allegedly enforcing these laws speaks to their inadequacies. Reminds me of the bta moving toward digital now…that took a whole team of high paid execs. how long to come up with this? In this digital age? Give yourselves a raise! more $$$ bieng flushed down the toilet. Where’s the accountability? Or is that only applied to those at the lower end of the ladder? Enforcement of the law is always the weakest link. You know, sometimes we sound less intelligent that I’m sure we are! Measures like this one are put in place to help. What would really help is if each one of us could act responsibly and in our own best interest. When we’re talking about cannabis reform everyone is up in arms about how terrible alcohol is for you (compared to weed) and then when the focus is put on alcohol, people want to get all weird like the government’s trying to hold you down or something equally ridiculous. We don’t need their help… we hold ourselves down every single day… just read the comments section of news articles. What’s missing for me in the article is how they will enforce this. It makes no sense to put rules in place unless you are willing and able to enforce them… with sensible, natural consequences would be ideal. Reponsible operators have always enforced a strict carding policy and we certainly do at Bermuda Bistro @ the Beach ans we are open to 3am nightly 363 days a year. We value our liqueur license and our relationship with the police and yes we sometimes have problems late night due to the nature of the business we are in . The focus should be on the one or two rogue licensed establishment that paints us all bad but more importantly the real problem are the parents that leave no idea what their children are doing especially late night when Bermuda is not safe especially for young female. IMO opinion increased scrutiny should be on events where a temporarily liqueur license is issued for a one off event as that is where I see several violations . If they not 18 they shoudnt be in clubs period. Need to find another island to live on! Too many rules! What’s democracy anyway? Oh, that’s right…living by someone else’s rules. Over zealous nuts! Mandatory carding if asked…back when I was 17 I already had a good bit of facial hair and I use to drink at Flanagan’s all the time never got carded I guess because I looked older. Nice to see other establishments supporting although I’m not sure how many young folks drink at Warwick Workmen’s. Back when I was 16, so many years ago, I had no problem getting in to a club and buying drinks. I thought at the time (though I know better now) that I looked at least 20, but in hindsight people didn’t care, they just wanted to make a liquor sale. I’m saying that to say, in order for laws to actually work, they have to be enforced. This is a nice photo op for the milkman, but I wonder how many 16 or 17 year olds are still going to be able to go to the club and get tapped. Lol. Do they even still say that? I’m showing my age now! what’s next produce your birth certificate? LoL! What happen to the parents,more baby sitting by the government. Ridiculous!